Uses for these lightweight, portable scales are almost limitless. With detachable indicators and built-in carrying handles, they go with you anywhere weighing is needed. Their large, easy-to-clean platforms feature a black, slip-proof mat, leveling eye, and non-skid plastic feet for stability. The digital displays feature both Body Mass Index calculation and may be mounted on a table top or wall. 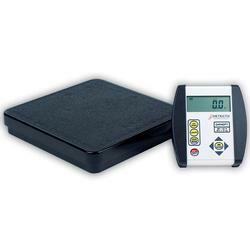 Operation is provided by battery power which increases the portability of these compact scales. The perfect scale for those who need a lightweight, portable scale. Optional black carrying case with handle protects the scale for easy transport.